Shattered Glass is the twelfth movie I've seen in the theater this year. The movie is about the young (median age: 26) journalists and editors at The New Republic. One of the journalists, Stephen Glass, spent most of his career at the political magazine fabricating stories. One of the editors, Charles Lane, discovers this and deals with the consequences. This is a simple story, but it's told so very well. It's also a kind of 'genre' movie: the journalistic drama. I'll admit that I'm drawn to journalistic dramas. My two favorites: All the President's Men and The Insider. Shattered Glass actually makes a brief reference to the first one. 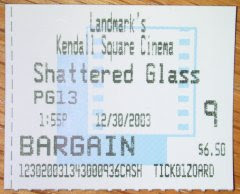 Since "Shattered Glass" is based on fact, it was up to writer/director Billy Ray to compress and composite the characters and events to make a dramatic picture. He did this superbly. He somehow made the work of writers and editors very dramatic. The acting is straightforward but the casting was perfect. Juxtaposing the dashing Hank Azaria, who plays Michael Kelly, the editor who gets fired for defending his writers with Peter Sarsgaard, who plays Charles Lane, as the stiff, unpopular successor sets up the office politics brilliantly. Hayden Christensen plays the story fabricator. 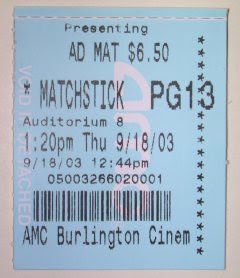 As the movie develops, his character becomes more and more desperate and the audience along with the editors begin to doubt even the memories that the film presents as his own. This is a terrific movie, and it honors the genre of journalistic dramas. It's that magical season again, a time of gift giving and gift receiving. As I get older, the two-sided coin of gift giving and receiving has become more and more worn. It's hard to find the shiny spots anymore. Somewhere along the way, giving gifts has become a chore (or at best, another item on my to-do list). And receiving gifts hasn't gotten any easier. My wife and I have developed a highly sensible approach for the holiday season. We simply tell each other what we'd like. This starts as early as Labor Day. By the time I buy gifts, which I now do almost exclusively on-line, it's a matter of crossing items off a very detailed list (often with catalog and item numbers). We rarely surprise one another nowadays and this makes me wistful. I like to think I'm a very gracious gift receiver, but somewhere along the line, I started making enough money to buy myself my own gifts. If I find myself wanting a music CD, or a book, or a new computer part, I buy it. I don't wait for a holiday, or my birthday, or my anniversary. At work, a bunch of us were grousing about how competitive gift giving can become. The secret Santas. The price limits. Who gave what to whom. Gifts become a measure of the giver and the recipient. "Oh, he can afford to give that. Oh, he deserved that; he's out of work." Instead of sentiment, it's judgment. Since we have a daughter, Jenn and I have returned to simpler emotions regarding the holidays. Mia's at an age where handing her packing tape is a cause for high celebration, and we can't wait for her to open the myriad of gifts that we bought her. In her squeals of delight, in her simple eagerness to tear away the wrapping paper, I remember that gifts symbolize love and generosity. "I'm thinking of you." "I love you." I think receivers and givers should remember that this magical season. I'm down a bit. I had a transaction go "bad" on eBay (I'll write more about this later). I had to leave work "a little later than usual", which always irks me as it disrupts my commuting routine. And to top it all off, I actually wanted to do some work from home but my PC at work seems to be flaking (I connect to my work PC via TightVNC over SSH). I'm also down because I spoke with a former co-worker this afternoon, and we were reminiscing about our high-tech careers. As we were going over where we were and where we wanted to go, I was sensing that he made some good decisions career-wise and that perhaps I haven't. It's always important to look up beyond the trees to see what forest you're in. Are you in a good situation? Does it fit in with your values, your vision of yourself? Do you have a vision of yourself? For me, I have values, I have a vision. Today, career-wise, I wonder if I'm in the best situation. I made a small album of pictures that I took when I went outside to shovel. The plow didn't arrive until 7PM tonight. I missed my newspapers. I missed church. I missed take-out. At least I got some exercise. I tried shoveling in the early evening. Unfortunately, snow continued to fall, covering up my efforts. We'll probably get outside as a group tomorrow (Jenn, Mia, and I). We'll try to tackle the shoveling together. The key is to get a break in the snowfall, but that probably won't happen until after lunch on Sunday. New England's first Nor'easter of the season is upon us. We live in Arlington, indicated by the red star. All the white stuff on the map is snow. It's been snowing steadily, at times furiously. The shoveling looks formidable. Our street is impassable, but we won't be venturing into our cars, except to grab shovels. No take-out today, it seems. The snow is predicted to last until noon Sunday. It's a hunkering down time. It's winter time (two weeks ahead of winter's official start day). This is the exact problem I'm seeing. Whenever I access my book mark for this page, I do not see my latest entries. Changing a record on the Domain Name Server involves updating a few records, and then letting the change propagate throughout the Internet. Apparently, the propagation can take a long time. Folks on the Tripod message boards (Tripod Club) are complaining about this very behavior. For those of you reading this at http://members.tripod.com/rick_umali/rickblog/blogger.html, consider yourselves fortunate. Your ISP is properly updated with respect to the new Tripod servers. Some of you are accessing this via http://rick_umali.tripod.com/rickblog/blogger.html. For some reason, this URL allows me to view the correct content. Either way, the estimated time to have the DNS records propagated is December 3. 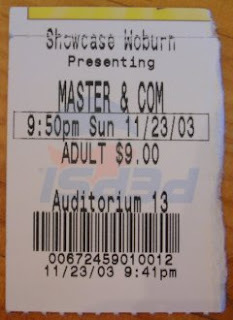 I watched Master and Commander three nights ago, my 11th movie in a theater this year. 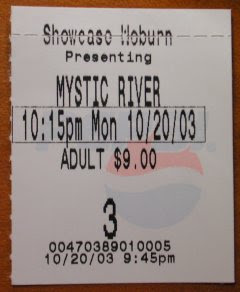 I saw the trailer for Master and Commander while watching Mystic River last month. At the time, I shrugged my shoulders and rolled my eyes. Another pirate movie, I thought. Another Russell Crowe vehicle. Then the reviews came out. One after another, the critics were gushing about Master and Commander. As the media revealed more about the film, I learned that the movie was based on Partrick O'Brian's naval history novels. I learned that the director, Peter Weir, directed two of my favorite movies: The Truman Show and Fearless. And even though I was going to give it pass because of Russell Crowe, I kept reminding myself that his acting in The Insider is a stellar acting performance that I keep revisiting on DVD. The movie lived up the billing. Big action scenes. Sweeping vistas. This is a movie meant for the movie theater. It demands a theater viewing to properly enjoy the magnificent sound effects ("sound design"). It seemed as if your ears were constantly filled with the creaking and groaning of the old boat as it sailed the seas. Your ears were buffeted by the wind and sea in their highest rage. The music was often introduced by the two lead characters who played instruments (violin and cello) in the evenings. Russell Crowe positively eats up the lead role of Captain Jack "Lucky" Aubrey. He is the captain of the English sailing ship, the HMS Surprise ("Surprise is on our side!"). He plays the big moments very big and very brash. He projects leadership, and by the end of the movie you can see why his crew followed him on his prideful, foolhardy endeavor of chasing after a much faster and more potent sailing ship, the French Acheron. Paul Bettany played Dr. Stephen Maturin, the ship's surgeon. He was Captain Aubrey's confidant, and they fought like rival siblings. Dr. Maturin provided the movie's gruesone, eye-averting footage of early 19th century medical practices. Anyone with even a passing interest in life on the open seas would enjoy this movie. The seascapes were fantastic. The close quarters and the inevitable "cabin fever" of 200 men on one small boat were clearly depicted. And lessons in leadership were on display, as the film explored the hierarchies of commanders and subordinates, and the strict price when leadership over men cannot be obtained. I agree with the critics. This is a grand film. There are some slow moments, but thankfully it's in the middle. The beginning, the climax, and even the denouement showed big movie making at its best. when I tried to publish this BLOG using Blogger to my host (Tripod). For the past two days, my previous entry sat in my "posts" queue. I sent a note to Blogger technical support. I posted a note to Tripod's message boards. Fortunately, after leaving the problem alone for a few hours, I attempted to publish again, and now things are working. The Tripod message boards suggest an issue on the Tripod side. Perhaps. I just hope things are resolved. John C. Dvorak, the noted computer columnist from PC Magazine, declared the blogging revolution dead. He points to a survey which states that 60% of a randomly surveyed 3700 hosted web logs were not updated in more than two months. The survey also states that the average length of these hosted blogs was four months. After that, the sites are moth balled. John Dvorak opines "Writing is tiresome. 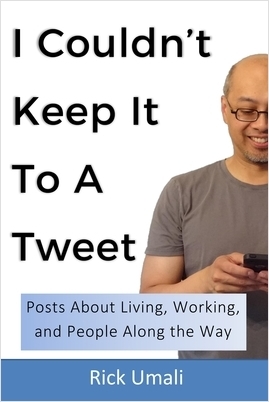 Why anyone would do it voluntarily on a blog mystifies a lot of professional writers." His column (titled "Co-opting the Future", in the December 9, 2003 issue of PC Magazine) goes on to suggest that "Big Media" is taking over blogging. I can agree that writing is hard. Half the time, I'm not even sure what I'm doing, or why I'm doing it. But despite the mysticism, I continue to write here. I don't know if I'm an exception to the rule. I don't know if I even care. All I know is that I'm glad I hopped on this band wagon. It's an outlet for me, one that I'm glad to have. "It has always been a personal goal of mine to run in the New York City marathon." "I just want to be at the start like the rest of the runners, and respect the tradition." The author of these statements: Sean Combs, aka P. Diddy, aka Puff Daddy, one of the great names in rap music, as a business man and as a front man. He finished the marathon in 4 hours, 14 minutes, and 54 seconds. umali.com is once again up for sale. This time the price has gone down. It's now selling for $299. When I last wrote about this, the price was $950! I just put in a bid for the domain ($200). We'll see what happens. My family is up for the Halloween weekend. Both my brothers, and my Mom and Dad. It's always festive for me when they visit. Mia has been drawing faces. Her circles are free-ranging ovals. Her ears are scratches next to the head. The eyes and mouths are mostly in the right place. Her 'signature': a tiny line representing a pony tail on the top. Am I living with a person of artistic talent? Friday, October 24, was Take Back Your Time Day. This grass-roots "movement" attempted to make a dent (or at the very least, make a scratch) in the well-rooted mentality of working "extra hours", or long hours. I applaud such a movement. At my former employer, Open Market, I was a classic "long hours" guy, especially in my last few years. I often gutted out fifty, sixty hour work weeks. On top of that, I added more hours by being "on-call" after work (I was a customer support technician for an e-commerce system). I have missed my wedding anniversary by being on a customer visit. I have worked draining technical issues ("help, my system is down!") at nearly every holiday. When I was promoted to management, the hours didn't go down, but they changed into an even more stressful version of my "individual contributor" years. I had the occasion to read my diaries from those years. There were plenty of entries in big, angry letters: "I'm so SICK of working!" and "I'm so TIRED!". I was loyal, but I was burned out. So I had mixed emotions when the company, in a steep downward spiral, decided to transition the product I supported overseas. I volunteered to be laid off (there were incentives). Three days before the lay off date, my daughter entered the world. My work life abruptly ended, and it was incredible. I didn't work for the next two months (eleven weeks, actually). I lived on severance and unemployment checks. Mia was her own "after-hours" operation, but it was a stress and pressure that I could share with Jenn. While I was jobless, I began to write this BLOG in earnest. I read. I avoided wearing shoes. I watched movies. I put up rickumali.com. I had so much time. But I knew I couldn't "stay on the beach" forever. In June 2001, I rejoined the work-force, at another technical support gig. The customers, however, weren't working on "live" systems. They were developers, working on future systems. My hours could be regular, and there was no after-hours support. After a few weeks of adjustments, I found myself working exactly between 9 and 5. Sometimes earlier than 9. Rarely later than 5. I was rigid about when I left the office. I managed my workload so that by the time the 5 o'clock hour arrived, I was headed out the door. As a result, my days have achieved a relatively peaceful and pleasant routine. I get home by 5:45 PM. I have dinner with Jenn and Mia. On the weekdays, I put Mia to bed. Then I do clean-up and laundry chores. By 8:30 PM, I settle in for television (a DVD, or sports) or run out to see a movie (my resolution this year). Sometimes I do some computer stuff, or Internet stuff. I try to get in some reading and writing. Working 9 to 5 life has improved my work productivity. I try very hard not to slack off at work. I push myself in those hard hours (between 2 and 5PM), when the tendency is to slow down (I'm a morning person). But when 5 o'clock arrives, I am able to put down my work, and save it for tomorrow. I feel like a hypocrite because when I was in management, I often gave more credit to folks who put in extra hours, who put in extra time. Heck, I called some part of my group for a Sunday afternoon training session. Sunday! My mores have changed, I suppose. The premise of Take Back Your Time was to bring attention to the culture of overwork. Political solutions would be wonderful, but I believe overwork starts with the individual. We should look at ourselves closely if we're working a lot of overtime. And if we are, then what would it take for us to scale back, to take back our time? I watched Mystic River two nights ago. 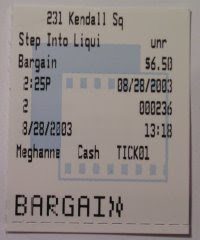 It was my tenth movie in a theater. Mystic River was originally a mystery novel by Dennis Lehane, a writer from Massachusetts. Clint Eastwood, the famous actor and now director, bought the film rights, and transformed Lehane's novel into a compelling film. It was a very satisfying adaptation, expertly done by screenwriter Brian Helgeland. 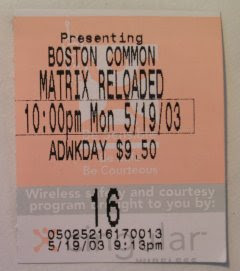 The buzz about this movie was strong for folks living in New England. 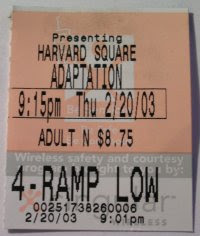 Eastwood decided to shoot on location, since the setting of the novel was in an area near Boston (Southie). I had read the newspaper reports and made a mental note to see this when it came out. The novel is a police procedural, but it is also a terrifying look at how child abuse can reap something sinister. It's also a terrifying look at revenge. Lehane's novel captured my imagination quickly. The characters were well rendered, and the action and mystery were sufficiently drawn. The movie moves very deliberately. I kept thinking how simple, how sparse everything was: the photography, the editing, the dialogue, the sets. Nothing was out of place to jar you out of the Lehane's world. As a reader of the novel, I felt this movie captured the essential emotions of the novel, which for me was the real miracle. The climax in the novel was a stunner. Bad things happen to good people. And bad things happen to bad people. Lehane's novel doesn't flinch, and because of this bravery, there's a powerful impact. I was left shaking my head at the end of the book: Oh my God. Thankfully, the movie doesn't flinch either. I feel as if I'm now fully recovered from the awful Red Sox loss to the Yankees in Game 7 of the ALCS. I won't rehash the details here. Suffice to say, the loss hurt. To some extent, this loss baptizes me into Red Sox Nation. Having grown up completely oblivious to sports, I had no allegiance to the home town teams of my youth. Instead of becoming a Yankee fan or a Mets fan, I spent my Jersey City, New Jersey childhood geeking out in front of computers. In 1986, the year the Red Sox lost the World Series, I was rooting for the other team, the New York Mets. I was a freshman in college, and there were partisans from both New York and Greater Boston. I rooted for the Mets because my youngest brother was rooting for them, and because (hell) I was from the area. Fast forward five years. I moved to Boston in 1991, and I finally went to see my first professional baseball game in that holiest of destinations, Fenway Park. I knew as soon as I saw that beautiful park that I wanted to know everything about this sport and about this team. I spent the next few years learning baseball under the tutelage of Boston Globe columnists. I read as much as I could about baseball and the Red Sox. The Red Sox teams of the 1990s were good enough to make the playoffs, but not good enough to take the final prize. I learned the cursed lore of the Red Sox, the Babe Ruth trade, Bucky Dent, Bill Buckner, and now (sigh) Aaron Boone. However, since 1991, I haven't been emotionally hurt by the team until last Thursday, the final game of this glorious season. I was devastated. The fog of that loss is receding now. I am starting to take in other sports (so many teams in Boston). I'm starting to think about movies again, and to pick up books that I put down at the beginning of the baseball post season. And, yes, I have tuned into a few innings of the World Series, but I still feel a twinge of bitterness. I am glad that we have a winter to rest and regroup. There will be time for baseball again next year. The Red Sox lost Game 7. The Red Sox won Game 6! Tonight (it's after midnight as I write this), a mere twenty hours from now, the Red Sox and Yankees will face off in a deciding Game 7. The gamut of emotions that I experienced tonight was incredibly draining! To think I'll put myself through it again. I better get some sleep! The Red Sox lost yesterday. Will they win their "must-win game" this afternoon (Game 6)? The game starts in a few minutes. Work? Really, how can I? The Red Sox and Yankees are now tied in their best-of-seven Americal League Championship Series. They have each won two games a piece. Now it's come down to who can win two games. It's hard not to just spout "Go SOX!" every time I'm here writing, but that's how I feel (Pedro's behavior notwithstanding). I just want to feel that winning feeling. Like when New England won the Super Bowl, or when BU won the NCAA (hockey). The game today is at 4PM. I'm at work, and all I can think about is the game. An old friend of mine, Ninju Bohra, called me this afternoon. He grew up in Chicaco, and wondered how I was holding up with the Red Sox. Not well, especially after yesterday's loss, and now tonight's rain-out. Jenn and I tried to get World Series tickets last night. We were unsuccessful. The Red Sox will pit Pedro Martínez against Roger Clemens this afternoon, in what should be a pivotal Game 3. The atmosphere in Greater Boston and in New England has been filled with anticipation. And so has my humble home. In a bizarre two game home-stand, the Red Sox have won two games to tie the Oakland A's in the Americal League Divisional Series. Each team has now won two games each, and the fifth and deciding game will be tomorrow night, 8PM EDT. It's a heady atmosphere here in Red Sox nation, a state of mind that I haven't visited in quite some time. The Sox were down two games going into Saturday evening's game, and things looked bleak. My prayer for the Sox on Saturday: don't get swept. After the win Saturday night, my prayer for Sunday was get the win and tie the series. The Sox did just that, their big bats coming alive at just the right moments. Now the teams are flying to Oakland, California for the deciding game. And I'm praying for victory. The New York Yankees are awaiting the winner. I hope we can be those winners. Last weekend, I read Stephen King's book On Writing. It was marvelous. I read Stephen King books in the 1980s. I read all his classics: Carrie, Salems' Lot, Cujo, The Stand, The Shining, Different Seasons. They were a thrill to read. It was hard to believe that such huge books could be read so fast. However, when I graduated from high school, I stopped reading King. I moved on, I suppose. In a memorable line from a foreword/introduction to one of his books, he stated that his books are the equivalent of a cheeseburger and fries. I eventually found other sumptuous meals. Just a few weeks ago, a colleague at work said he read Hearts of Atlantis by King. On a lark, I bought a copy of that book, plus On Writing, which I have always been curious about. On Writing contains a surprisingly moving and inspirational memoir about his life growing up. Sketches and images of his life are drawn quickly, many of which made me laugh out loud. He recounts the precious moment when he first wrote a story (at the age of six), to when the paperback rights were sold for Carrie, which marked the start of his success. The final part on On Writing deals with the horrible accident that nearly killed Stephen King in 1999. In a gripping narrative, I found myself in his spell. The moment of impact. The panic of emergency care. The pain of surgery. The road to recovery. The return to writing. Stephen King was awarded the 2003 National Book Foundation's award for "distinguished contribution". Harold Bloom, a professor at Yale and author of The Western Canon wrote that this was a mistake, and proceeded to a scathing critique of King's work. Bloom's theme: "commercial success is not literary success". I agree with Mr. Bloom somewhat. Just because a book is a commercial success doesn't mean that it's literary. Last month I finished Empire Falls by Richard Russo, and it was far more "literary" than any Stephen King book I have ever read. If a Stephen King book is a cheeseburger at a local diner, then Empire Falls is the best three-course dinner in the finest restaurant you can think of. But I also disagree with Mr. Bloom's point that "King ... is an immensely inadequate writer." I disagree wholeheartedly. Maybe Mr. King doesn't belong in the same pantheon as "the great writers" (whomever they may be; Bloom suggests four: Pynchon, Roth, DeLillo, and McCarthy). But he belongs in the ball park. King is a more than an adequate writer. On Writing proves that. Alas, the little league baseball players from Saugus couldn't defeat Boynton Beach, Florida in tonight's U.S. Championship game. Congratulations on a super effort, Saugus! Florida will play Japan for the World Series title. Reading this carefully, you'll see that New England was up by eight runs going into the fourth inning. It was over. I was already cueing up the DVD for the evening. But then Texas chips away, until they score four runs with two outs in the final inning, to tie the score (in the Little League World Series, teams play only six innings). In extra innings, Texas put up three runs. But New England was able to put up four runs in the home-half of the inning to take the win. The actual baseball was quite good. These kids are a slower and smaller version of pro baseball. However, I did see a handful of dropped fly-balls (considered a blooper in the majors), a badly judged throw to home plate (a fielders choice that should have been an easy out to first), and a player get caught in a pickle, but the fielders couldn't get the out. The coaches exhortations to the players were broadcast over the air: "I don't want you feeling pressure. Just swing easy!" "Hey, that play is in the past now. Just concentrate on this out." Aren't professional managers saying the same thing? It was a great game. These kids played hard. Neither team gave in; one team just ended up scoring more runs. Congratulations Saugus! They'll play for the U.S. Championship on Saturday. Ideas. I seem to keep coming up with them. Snippets of dialogue. An opening sentence. A concluding sentence. I want to write write write write them all down. Sometimes I do. On little pieces of paper. In my car. Sometimes on the PC. Invariably, they make their way into a file folder, which has dozens of little bits of writing. Ideas for stories. Ideas for movies. Ideas for scenes. I'm anxious in front of the blank stare of open writing space on my computer. Will the words from my folder ever come out? Are they worthy? Maybe. Maybe. Elvis Presley died August 16, 1977. I'll be kicking out the current music in my car's CD player (Coldplay), and replacing it with Elvis' "Kentucky Road", and "Suspicious Minds." In today's NY Times, I read a beautiful essay by Maile Meloy about summer in Montana. There, the brief summers are earned after nine long months of winter. It was a perfectly evocative article. All winter, it had been below zero for weeks at a time. ... Windshields had to be scraped, and nothing in town was far enough away for the car's heater to warm up before you got there. "They call it a drowning machine. The water was so turbulent and aerated that there was no way they could stay above water." He was referring to the river water in which four boys drowned. The boys affectionately called one another the Baco boys, and in a reunion of sorts, they visited their childhood haunt, Split Rock Falls, 20 miles miles east of Lake Placid. One of them, David Altschuler, slipped and fell into the Boquet River. The recent rain water and the nearby water fall churned up the high water so much that the body's natural buoyancy was defeated. "Even the strongest swimmer in the world couldn't have survived it," Lt. Larlow continued. The three other men, Adam Cohen, Jonah Richman, and Jordan Satin, friends since youth, jumped in. They all died. They were all 18-19 years old. Ever since reading The Perfect Storm , I've always thought that drowning would be the worst way to die. There's the struggle, as the body attempts to preserve itself. But then the lungs fill with water. Choking. More struggle, then the brain shutting down, the body fighting less and less. One of the Baco boys was co-captain of his swim team. They were all athletic. Did the three who jumped in to rescue their friend realize they were diving into a drowning machine? It's numbing thinking about it. It doesn't surprise me that Harvey Pekar has a BLOG. This is a man who's made his life available to others in illustrated books. How could he resist blogging? It's so easy to get caught up reading about Pekar's life in American Splendor that it's easy to forget that folks who blog are doing something very similar. Here's a very slim slice of my life, on the web, for you, the random reader, to either enjoy or press the "Back" button. In the last comic of The New American Splendor Anthology, "Meet Colin Upton", Pekar poses the question: "How can a democracy function in a nation full of people who believe that their lives and their neighbor's lives are insignificant?" His answer? "Imperfectly at best." I spent the past three days reading Harvey Pekar's book, The New American Splendor Anthology. Pekar's stories are illustrated, so it seems like I've been reading a comic book. A bleak comic book. It's like reading Lynda Barry, or Bill Griffith's Zippy. You know these kinds of comics: they're in the back pages of your city's weekly magazine, the kind that's given out for free at bus or train stations. Pekar's book is a mesmerizing look at his dilemmas and quandaries. He's a crank. He's compulsive. He's obsessive. He's a nine-to-fiver. He's a music fiend, a book hound, and he's always looking for a good deal. It's good stuff. I got put onto to Pekar because his life has become a movie, and it opens this month. When I got home, the TV weather that I watched reported flash flooding in the town where I work. The meteorologist was saying something about three inches of rain in one hour. I can agree: it was torrential. On the way home, I had the wipers at its highest tempo. The area of torrential rain was very small; once I emerged from this weather cell, the air was quickly dry, and rain-free. It's pouring now. A heavy, dark rain. I have a window seat at work, and despite the awful looking weather, I wish I were out there now. 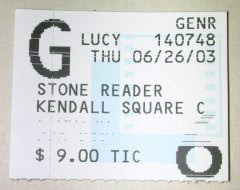 I saw the film documentary Stone Reader last week. It was a very satisfying reflection on the reading life. Books can move us, though this is rarely portrayed in movies. Some time ago, I watched Orange County, and in the first few minutes of that movie, the lead character spends a summer reading and rereading a book that makes him decide he wants to be a writer. The book simply changes his life, and it's the launch pad for the main plot of that movie. Mark Moskovitz's documentary is in a similar vein. The book The Stones of Summer captured his imagination in a such a forceful way that he wanted to read other books by the same author, Dow Mossman. However, as he dove into the library, and the Internet, he not only discovered that the author didn't publish anything else, there was barely anything published about the author. So Mark goes on a journey to try to learn all that there is about the author. Along the way, we learn about book publishing, book reading, and book reviewing. We learn about Mr. Moskovitz's deep love of reading, and the books that have affected him. We learn (or are we reminded?) that in the reverie of reading, the mind is actively constructing a world that the author builds, and this intimate action is incredibly unique, and incredibly engaging. Finally, we do learn about Dow Mossman, and the price of creativity, coupled with commerce. This was a wonderful, thoughtful movie. Last night, I rented the DVD of All the President's Men. I was mentioning this at work near the coffee station, and an older gentleman remarked that it was the anniversary of the break-in at Watergate just the other day (June 17, 1972). He said to the group of us that we probably hadn't even been born when this happened. Not so! I was four years old. The movie is dying for a director's commentary, an actor's commentary, a screen writer's commentary, and a historical critique commentary. Perhaps the kind folks at Criterion could spin this up. I'd buy it. 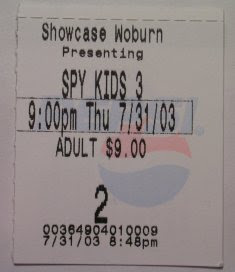 The impulse to watch it again was from reading the Boston Globe's profile on Senator John Kerry. When he was running for Congress back in early 1972, he felt Nixon operatives were at work to derail his nomination. "That Nixon sure was evil!" I thought. Then I started thinking about the movie. "I should see it again." Next thing you know, it's 11PM, and I start the two-hour movie. I couldn't break away from it. I highly recommend this movie. You never would think that a movie whose primary action consists of phone calls and furious typing would be so compelling, but it is. While searching for a computer part, I chanced upon another custom computer cabinet, this one geared to play MAME. It's Father's Day tomorrow. I'm a Dad, so I look forward to it. Jenn said that she and Mia would be taking me out for brunch. However, I can't rely on one day of the year to "feel special" about being Dad. I seek out Father's Moments during my week. Sometimes it's in the way Mia will grab my hand when we're out walking. Or, at the height of play, she'll be laughing and squealing, and she'll say breathlessly "Daddy!" Or the way she'll smile when I turn around to look at her when we're at a stop light. Being a Dad can be about hardship, exhaustion, frayed feelings. I'm tormented by the simple question: "Am I doing enough?" But it's also filled with moments of joy and pride and love. Tomorrow is the national recognition of those positive feelings, but after tomorrow, it'll be up to me to continue seeking out these precious moments. Last October, I wrote about throwing out my old hockey equipment. Today, I received an e-mail from Joan Broadway, who found that piece of writing while searching for Joe Jaena on the Internet. She gave me some terrible news: Joe passed away, in December 2000. Joe was the captain of the hockey team I played for. Her e-mail put me in a sad spell for a few minutes. I guess I always thought that Joe would find that web page himself, and drop me a line. Now I know that won't ever happen. 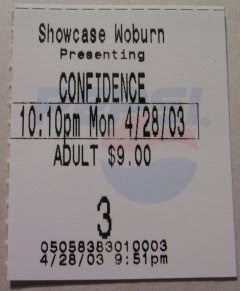 I watched Confidence in the movie theaters last night. The director of Confidence, James Foley, also directed Glengarry Glen Ross. Once I learned that, I knew I had to see this. GGR is one amazing movie! When I scanned the cast listing, and saw Robert Forster, that sealed the deal. I really enjoyed Robert's portrayal of Max Cherry in Jackie Brown; his role in Confidence is substantially smaller. (The cast was studded with super stars, including Dustin Hoffman and Andy Garcia). The movie was about a con, a crime, a heist. And like an old book from high school, it felt very familiar. The lead character (Jake Vig, played by Edward Burns with his trademark scowl) even says that a good con is like a play: everyone knows their lines. I was intrigued by some reviews that said you'll know what to expect, you just won't know when. The movie was like comfort food. You like it. Just enjoy it! And I did. While on my walk, I heard the distinctive sound of a wood pecker, pecking away. I was under him, by the proximity of the sound. I looked up at the four or five trees. The bird pecked-pecked, stopped, then resumed, then stopped. I had to wait for him to hammer before I could hone in on him. It took a few minutes before I could finally spot spot him. There he was! His head jack-hammering into the tree. Mia was blissfully pushing her hand through some dirt. My head was looking towards the sky. I'm happy to report that the slightest of grass blades have begun to appear. Jenn spotted them, while I was on my way out with Mia for a walk. "You have to look at the ground at an angle." Sure enough, there they were, so small and delicate. With the warmer weather coming, we should be seeing the green fuzz of new grass over the next few days. I'm excited by this possibility. Two Sundays ago, Jenn's Dad came over and we planted some grass. We raked and prepared the ground, then spread fertilizer, then spread seed. So far, no grass. But today, somewhat at work suggested that it's still a little too cold for the grass seeds to grow. He said to wait until a few weeks of solid evenings in the 50 degree range. I'm guessing that's mid-May. Today, the temperatures are expected to be over 70 degrees! I'll be wearing short sleeves, and I'll be carrying my light jacket. Unfortunately, the weather will turn cold again. Up and down. New England weather. But today will be a wonderful bite into warm sunshine. I turned thirty-five years old today. I spent the last four days attending a training seminar on VxWorks, the real-time operating system from Wind River. This operating system is booted up and loaded to run the small computer program used by some modern fighter jet ejection seats. The computer program calculates an angle, according to the Michel Chabroux, the instructor of our seminar. He brought up the ejection seat story because it illustrated the need for a fast booting operating system. VxWorks can go from zero to application run within seconds. I know it takes my PC up to a minute to fire up, and then it takes up to a minute to start mail, and my web browser. Jenn and I typically leave it on during the day. A pilot needing to abort can't wait that long. I spent the week looking at the operating system that helps him out in this situation. Who was the programmer who wrote that little program? How big was the VxWorks OS (it can be made very small if you don't need all of its features)? If you're reading this, send me an e-mail! Jenn noticed in the obituaries today that Michael Jeter died. He played the lovable "Mr. Noodle" on Sesame Street. Mia could say his name ("nooou-nooou"). Jenn and I delighted in his very expressive acting. Elmo always introduced Mr. Noodle as "Mr. Noodle's brother, Mr. Noodle!". Reading Mr. Jeter's obituary, it's striking to realize that you probably have seen him, even if you don't watch Elmo. He was in The Green Mile (with Tom Hanks), Patch Adams (with Robin Williams), and True Crime (with Clint Eastwood). But I won't be missing him in those roles. I'll be missing Mr. Noodle, Elmo's comic relief. I posted pictures of Mia from the past birthday weekend. Enjoy! My daughter turned two years old on March 28. We had lots of fun having a little party. She didn't seem to like the cake though: she cried furiously when the candles were being lit, and she didn't even want to sit near it. Thankfully, later, she did have some cake for a snack. I'll have the obligatory pictures up on the web site soon. Rumalia, the name for some oil fields in Iraq, contain my last name, in between an "R" and an "A". "R"-"UMALI"-"A". It's odd now seeing the name Rumalia go by in some CNN Headline News pop-up or MSNBC news "crawl". Do you think Saddam Hussein ever googles himself? If he does, he may hit this page, and be counted as one of my "visitors". If so, then I would be remiss not to remind him that he has under two days, as I write this, to leave Iraq. Or else! A woman missing for the past nine months is now found. A man about the executed, was given a reprieve within ten minutes of his execution. A miraculous day. It's now been two years since I started writing this BLOG. I read an article a few weeks ago about Junot Diaz, a writer who is experiencing writer's block. I don't write professionally; this is the only outlet I have for writing, and I suppose if I needed to do this professionally, I probably will encounter days in which I couldn't get it going. Since March 10, 2001, I wrote 330 entries into this BLOG. Some entries have been as short as a few words. Others were lengthier. I doubt that any entry is as as long as a typical column done by the columnists I like to read. Some of them, like Sam Allis, have columns that appear once a week. Others, like Bob Ryan, have columns that appear two or three times a week. While at my Mom-in-Law's, I skimmed through Andy Rooney's book Common Nonsense. In it (I'm paraphrasing), he said that people who think writing is easy sometimes equate it with penmanship: the act of writing as the physical act of putting letters to paper (or typing, as I'm doing now). That writing is easy. But the writing that he does, and the writing that Mr. Diaz does, as well as Mr. Allis, and Mr. Ryan, is pretty hard. Or is it? Billy Joel wrote "New York State of Mind" in an afternoon. Paul Thomas Anderson said it took him a few months to write Sydney, which is the equivalent of speed-writing in Hollywood. But he admitted that it took him a year to write Magnolia. Quentin Tarantino said it took him a year to adapt/write Jackie Brown, and it was already a published book (Rum Punch, by Elmore Leonard). Bill Weld has now written three books, all after his years as governor of Massachusetts. He said that in school, he learned to write from outlines. He decided one day to make an outline of a book, and go from there. He made it sound so simple. And maybe it is. For me? Some days it's easy to produce sentences, produce words. Others...well, let's say I'm glad I don't have to do this for pay. Well, it's late. Happy reading! Good night. Today was Ash Wednesday. I received ashes in the morning. The older I get, the less perturbed I am by Lent, the forty days before Easter in which Catholics are normally abstaining from meat on Fridays, as well as giving up "something". I heard a homily last Sunday in which Lent should be thought of as a period of "feasting" on positive things, and "fasting" from negative things. I found the list mentioned in the homily, and it's a wonderful sentiment going into this Lenten season. I've been busy with my BLOG actually. I finally added two features that I've been meaning to add for quite some time: links and comments. Each specific entry in this on-line journal can be linked via a URL to the archive page which that entry belongs to. Moreover, the link contains a NAME field, which will also allow direct the browser to the specific entry. I had a heck of a time getting this to work, and I plan to document it later. But even better than links are comments. Thanks to Blork's Blog, I found Enetation, a web service for hosting comments you may have about any specific entry. Just click on the comments link, and drop a quick line. Your e-mail and web addresses are optional. I watched Spike Lee's movie 25th Hour last night. I heartily agree with those critics who say that this is Spike Lee's finest work. The last movie that I saw by Spike Lee was Bamboozled, a satire that had a preachy feel to it. I saw this on DVD. 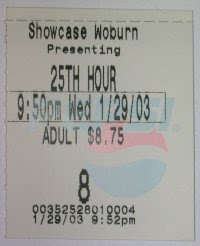 25th Hour is a simpler story: a man, about to serve a seven-year prison sentence, is living his last day as a free man. He meets with his father, with his friends, with his enemies, with his lover. Despite the somber theme, the movie was oddly touching. The signature Spike Lee moments are here: the rant to the audience about New York, an actor floating across the scene on a dolly, the nod to New York sports (a New York Yankees cap has a brief role in the film). But Spike also let's the story and the characters bloom in a way that felt very different from Bamboozled. His latest "joint" feels fresh. 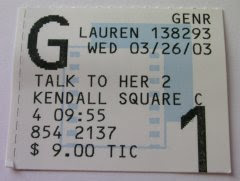 I am glad this was my first theater movie of 2003.